Actually number 3 is my favorite coat, pink color and look so bright. You will be very striking with it, because the color looks like a candy wrapper, lol! You can buy it on Persunmall.com, one of my favorite website store. i love all the coats you picked!! I've never thought of a raincoat as being so fashionable until seeing this post. I didn't realise there were cool ones available! Thanks for your comment I'm following you now! I really like the first, the second and final coat. 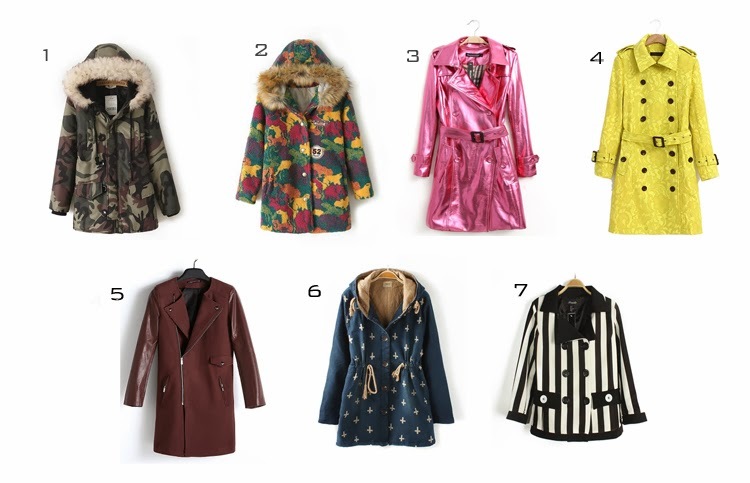 The coat number 3 is obviously my favourite, but I think I'll use more the number 6.
great blog.. Can we follow each other via g+ bloglovin and gfc? awesome collection of Sweaters for Girls ...loved the post !! !